Spermophilus columbianus, the Columbian ground squirrel, is found in the Rocky Mountains west of Montana, Idaho, eastern Washington state, the mountains of central and eastern Oregon, and southeastern British Columbia. Squirrels are interesting in that their skulls are highly conserved, having changed little since the oldest-known squirrel (Protosciurus) appeared in the late Oligocene. This can be easily seen by comparing S. columbianus to S. variegatus, the rock squirrel, Cynomys ludovicianus, the black-tailed prairie dog, and Sciurus niger, the eastern fox squirrel. For this reason, one could call squirrels 'living fossils'. To date, the lack of significant variation between squirrel species has frustrated efforts to discover their phylogenetic relationships. However, DNA-hybridization data suggest that ground squirrels are closely related to marmots, having diverged from them in the late Miocene. CT scanning offers the opportunity to easily acquire information on the internal anatomy of squirrel skulls, and to apply morphometric tools to their study. It is hoped that this will contribute to the eventual resolution of the squirrel family tree. This specimen, from Walla Walla County, Washington, was made available to the University of Texas High-Resolution X-ray CT Facility for scanning courtesy of Dr. Donald Swiderski of the University of Michigan. Funding for scanning was provided by a National Science Foundation Digital Libraries Initiative grant to Dr. Timothy Rowe of The University of Texas at Austin. The specimen was scanned by Matthew Colbert on 29 July 2000 along the coronal axis for a total of 413 slices, each slice 0.138 mm thick, with an interslice spacing of 0.138 mm. Elliott, C. L., and J. T. Flinders. 1984. 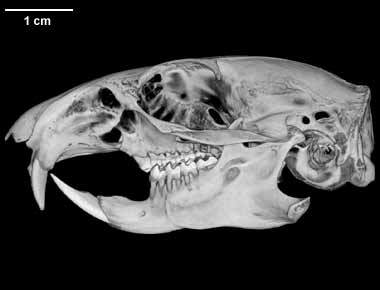 Cranial measurements of the Columbian ground squirrel, Spermophilus columbianus columbianus, with special reference to subspecies taxonomy and juvenile skull development. Great Basin Naturalist 44:505-508. Elliott, C. L., and J. T. Flinders. 1991. Spermophilus columbanus. Mammalian Species 372:1-9. Giboulet, O., P. Chevret, R. Ramousse, and F. Catzeflis. 1997. DNA-DNA hybridization evidence for the recent origin of marmots and ground squirrels (Rodentia: Sciuridae). Journal of Mammalian Evolution 4:271-284. To cite this page: Dr. Jessie Maisano, 2001, "Spermophilus columbianus" (On-line), Digital Morphology. Accessed April 19, 2019 at http://digimorph.org/specimens/Spermophilus_columbianus/.